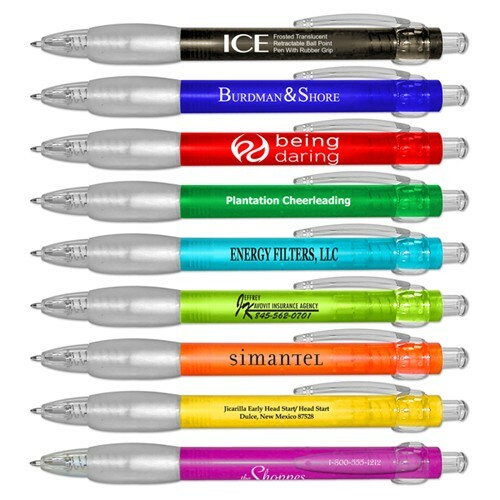 Want a "cool" idea for your next promotion1/3 The "ICE" pens frosted barrels in a variety of color choices are sure to brighten up any imprint. With clear rubber grip for added writing comfort. Black ballpoint ink. Color Selection: Available in Black ink with Black, Blue, Red, Light Blue, Light Green, Purple, Green, Orange and Yellow translucent barrels. Price includes one color one location imprint. Packaging: Bulk 500 @ 14 lbs.